MB Astrology Planetary Patterns Software finds the planetary patterns as they are displayed in your astrology natal chart and tells you the influences of the astrological planets considering their planetary patterns or planet positions. The interpretation of planetary patterns as delivered by MB Astrology Planetary Patterns Software includes the influences of the planets as they vary according to the locomotive pattern, splash pattern and bundle pattern. The influences of the astrology planets on the various aspects of the personal as well as professional lives of the individuals depend very much on the planet patterns at the time of your birth. For instance the influence of Mars, if positioned in the 5th house, is different from its influence if it is placed in the 7th house. Again, if the planetary patterns in your natal chart show Mercury and Jupiter to be placed in the same house, their impact on the nature and personality traits and even on the basic and natural tendencies of an individual would vary from their usual type of influences. If you want to get your astrology natal chart that presents the astrology planetary patterns, you should download MB Astrology Planetary Patterns Software and get a free planetary pattern analysis. This unique software also explains to you the influence of the astrology planets taking into account their planetary patterns. It is a very simple and easy-to-run astrology tool. 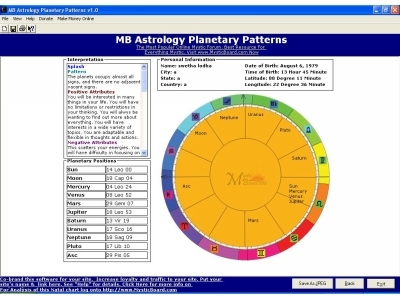 You can download MB Astrology Planetary Patterns Software absolutely for free.